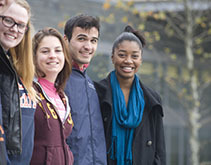 Salem State offers many ways for students to get involved on- and off-campus through student groups and clubs. Groups manage their own activities through an independent platform--visit the groups and clubs event listing. If you're looking to get involved, contact Melissa Arroyo or Alliane Hughes for more information. Encourages professional interest among students preparing for careers in accounting. Unites African students and raises awareness of African issues, culture and values. Offers opportunities to meet, support and plan events for gay, lesbian, bisexual, transgender students and their straight supporters. Through our numerous partnerships and sponsors with large corporations, organizations and financial firms, varying across various industries and fields, we connect a global network of almost one million passionate Latino Leaders to career, networking and professional opportunities. Promotes and protects the field of advertising. Exposes students to the practical and ethical practices of marketing in the business world. Campaigns to end grave abuses of human rights and to ensure that every person enjoys the rights in the Universal Declaration of Human Rights. Encourages the appreciation and understanding of Anime media. Provides activities for students to have a better understanding of different Asian ethnic backgrounds. Offers opportunities for students to expand their knowledge of biology. Focused on women’s empowerment and professional skill-building, BEES offers self-identified women of color an opportunity to gain skills and knowledge necessary to reach their personal and professional goals. Focused on academic success and retention, The Brotherhood offers self-identified men of color resources and mentorship to reach academic and achievement goals. 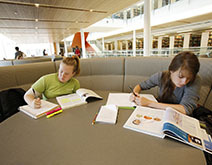 The Brotherhood aims to support academic persistence, and connect students directly to faculty/staff resources. Offers training and workshops on sexual assault education and prevention. Provides opportunities to further investigate the field of chemistry, including all applications of science. Advance the policies and ideals of the Democratic Party. Works alongside the American Cancer Society and educate the Salem State community to promote cancer advocacy and education. Hosts Relay for Life, a 12-hour annual event on campus. Provides service events that will enhance the well being of the Salem State community and the surrounding area. Brings students interested in programming together and raises awareness of computer science issues. Enhances students’ awareness in the field of criminal justice through group activities, guest speakers and field trips. Promotes and conducts educational activities about geological sciences and the earth. Encourages the understanding of economics in theoretical and practical applications. Provides learning experience that help guide and support professional development to the students with an interest in the field of exercise science. Provides learning experiences, career awareness and networking opportunities for students. Operates as a resource and referral service for women with a diversity of needs. Promotes awareness of Francophone cultures through a variety of programs. Expand knowledge of current educational techniques and practices, while networking with practicing professionals. Promotes the general welfare of the overall fraternity and sorority community. Provides opportunities to celebrate and learn about Judaism. Promotes interest among students in Hispanic history and culture by sponsoring educational, cultural and social events. Engages students in historical study and discussion. Provides educational activities to increase knowledge about the hospitality field. Provides a recreational club sport. Members will participate in men's ice hockey home games, as well as additional team events. Enhances the academic experience and global business knowledge. Fosters international awareness and cultural exchange between all members of the university. Promotes further knowledge of Italian culture through films, excursions, presentations, and discussions. The club also provides students and faculty opportunities to communicate in Italian. Fosters a community of students and faculty who follow Jesus as Savior. Promotes interest among students in Latino history and culture by sponsoring educational, cultural and social events. Provides students with an avenue whereby they can get together to explore their heritage. Provides a social and cultural forum for musicians and non-musicians alike. Promotes political thought and discussion through speakers, trips and model U.N. competitions. Provides opportunities to learn about law school, careers in the legal profession and contemporary and historical issues under the law. Educate, raise awareness, and advocate on campus and in the community about first generation students. Provides a variety of social, educational and recreational activities for the student body. Provides a social network for students interested in psychology. Provides scholarships, internships, leadership workshops, networking, travel opportunities, and job placement assistance. Provides a professional level dance company of the highest caliber. Represents the resident student population in all matters concerning the quality of living on campus. Promotes the rugby union football on campus and on the North Shore. Provide an opportunity for all students to share their interest and sense of belonging in the running community. Expands and pursues the academic field of geography. Help to broaden literary horizons and relate to the world around us through reading and analyzing books. Promote the principles of the Republican Party. Serves as the campus newspaper and the independent voice of the students. Allows students to learn and practice American Sign Language through activities. Provides opportunities for SCUBA divers of all skill levels to improve their diving skills, encouraging dive safety, and organizing dive trips for all members of the organization. United people with an interest in Spanish language, culture and history. 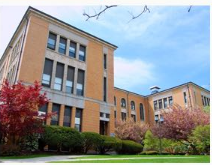 Creates a sense of community, academic and social enrichment within the SMS department. Creates and performs a capella music on campus and in the community. Enhances an awareness of the field of social services among students. Represents interests and provides activities for commuter students. Serves as the sole voice of the students to the administration, faculty and legislators. Promotes the political philosophy and principles of liberty. 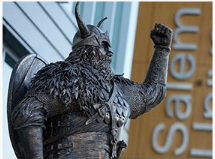 Promotes a culture of gratitude and provides students the opportunity to give back to the Salem State community and help fellow Vikings. Serves as the governing and representative organization for nursing majors. Provides students with performance and production opportunities on campus. Assists military personnel and their families in achieving their educational goals by providing assistance and support. Provides opportunities to play organized Ultimate Frisbee on a competitive team. Enriches the education and experience of the technical theatre students and spreads knowledge about theatre technology. Teaches students about urban cultural expression through performing and visual arts. Provides progressive and alternative radio programming.